As if I could come up with a better title than the one given by the joint venture of the Cleveland Museum of Art, the Walter’s Art Gallery in Baltimore and the British museum in their joint venture. 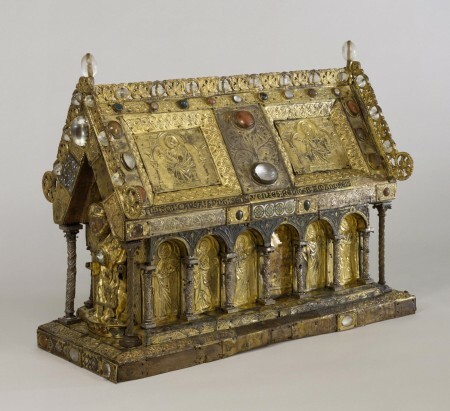 Looking at material from 330 AD to 1450, the exhibition “explores the spiritual and artistic significance of Christian relics and reliquaries in medieval Europe. Exhibitions are, in my opinion, first and foremost about the works of art that they show but the ambience they are set in is extremely important as well, and every exhibition looks different in a different venue (a Missive for another day). The installation conveys the curator and designer’s vision of the exhibition. At the British Museum, as you enter the dark rooms of the exhibition you hear liturgical music throughout. The religious objects are all on blue grey material, until you get to the relics of Christ where everything is against a royal red background. Subtle changes like this that you might not even consciously realize, are most evocative in creating the atmosphere, and, as a result, one’s understanding of the material. Among the earliest pieces in the show are sarcophagi. These were created to hold the body of an important personage and most often to be seen above ground and therefore often richly carved with ornament or scenes from the deceased’s life. Relics could consist of a bone from a saint or a fragment of a garment, something to be venerated in a public ceremony or a private chapel. Later in medieval times relics were enshrined in finely crafted containers, often created by a goldsmith. 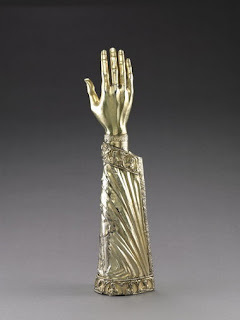 The shapes varied sometimes indicating what the relic in the reliquary was; for instance, the beautiful late 12th century German “Arm Reliquary of the Apostles” from the Cleveland Museum of Art which was part of the, so called, Guelph Treasure. The museum acquired it with several other pieces from a consortium that my family was part of in the early 1930’s. Then there is the shrine (aka a châsse) of Saint Amandus from the early 13th century called “The Heavenly Jerusalem” from the Walter’s Art Gallery. It unfortunately has losses and additions but it does give one the spirit of this type of object shaped like a church to contain relics. I must, however, admit to missing the great châsses (many many times as large) from Aachen and Cologne but these, are considered so important that it is unlikely they would ever be lent. It is a bit like throwing a wet towel on your face after having been mesmerized by the religious fervor of what came before, and is probably very much what the protestants felt when Martin Luther came to the fore.